I’ve always liked February! In Finland this month is a proper Winter month with temperatures below freezing. I remember from school that February was filled with little treats. Obviously, there is Valentine’s day, which in Finland, is Friendship day and therefore not just for lovers. When Valentine’s day came to Finland in the 80’s Finnish Red Cross suggested that it should include everyone, not just people in relationships. Hence, 14th of Feb has been a day to remember friends and family. Then there is Laskiainen, the celebration 7 weeks before Easter which also used to mean the start of lent for the religious. The tradition goes that you go sliding down snow covered hills or sledging in a circle (napakelkka) and afterwards eat pea-soup with ham (the last bit of the Christmas ham according to an urban legend) and a bun filled with cream and jam. 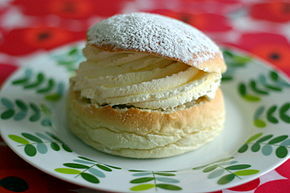 For me, the cream filled bun is the best bit of Laskiainen! These buns are very easy to make, they are normal buns that are then cut in half and filled with cream and jam (after the buns are cooled down). On 5th of February there is also Runeberg’s Day that celebrates Finnish National poet Johan Ludvig Runeberg. For me, again, the best part of this celebration is the Runebergin Torttu (=Runeberg tart) that is very unique and very delish! I’ve never attempted to make them, but I really miss them in February. Luckily my mum buys them for me in Finland and freezes them so I can have them when visiting! There is a recipe in English here. Other nice February things in Finland are school holidays and the few days before the holidays, as the eldest students in the 6th form leave the school and drive around towns in trucks and throw sweets to the kids. The day after, the new ‘oldest’ class has a prom after which the school winter holidays starts! So no wonder February is a fab time to be in Finland!